Actifio is using its copy data virtualisation technology to provide application recovery and test environment creation in a data centre or up in the cloud, and management at VM-level instead of storage LUN level. The Resiliency Director works with Activio's CDS and Sky products to do this. Actifio's CDS product makes a “golden copy” of production data and then produces virtual instances of it on demand – for example, for test and dev purposes, or for a database operation, or backup. It uses a Virtual Data Pipeline (VDP) to create virtual point-in-time copies of data for use by any business application. The point-in-time copies are built up from deduplicated blocks of data and the point of the exercise is to reduce the number of copies of a user's data and thus the need for disk storage. Actifio Sky is the software-only version of CDS. Sky for ROBO is for remote and branch offices and provides data protection for them, shipping their data up the WAN to the data centre. Actifio says its Resiliency Director "orchestrates compute, network, and data at an enterprise disaster recovery site or a cloud service provider and validates the results to provide a complete solution for non-disruptive, automated recovery and test." There are some 400 Actifio customers worldwide, both enterprises and cloud service providers. One of the latter, managed recovery service provider Sungard Availability Services, has tested Resiiency Director and recovered 100s of VMs in under 20 minutes. With Resiliency Director, Actifio says "the disaster recovery process – from testing to actual execution - can be ... automated, the time spent on recovering large numbers of applications and virtual machines is collapsed from days to minutes." It enables a CSP to offer Disaster Recovery as a service (DRaaS). 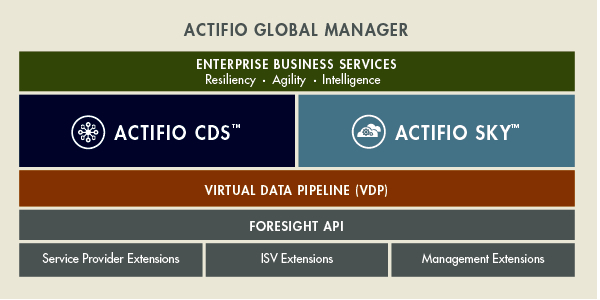 Actifio says Resiliency Director is the first of a number of service products that will use its copy data virtualisation technology. Ash Ashutosh, Actifio's CEO, has a canned quote about this: "Actifio Resiliency Director is part of a portfolio of services designed to make it even easier for our customers and cloud service providers to capture, manage and use data – delivering unprecedented service levels." Actifio received $100m in funding in an E-round in May. As far as we understand it there is no other supplier with equivalent technology. Get a Resiliency Director datasheet here (pdf) and a VDP tech white paper here (pdf), registration required.